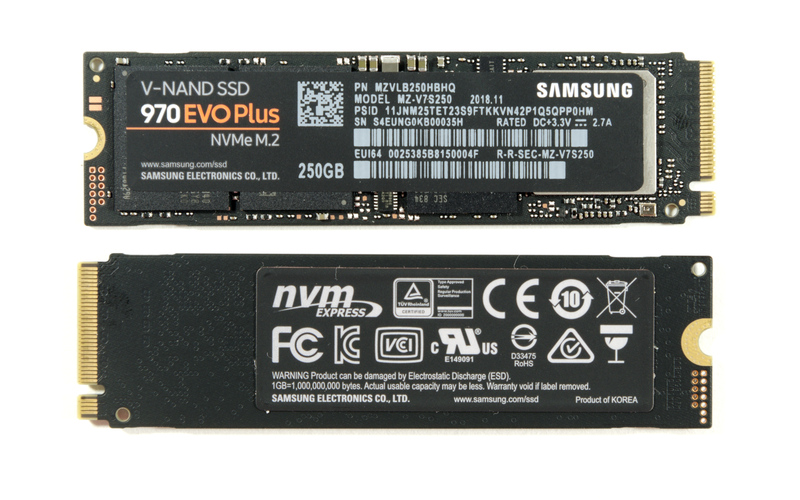 The first retail consumer SSDs to be updated with new 96-layer 3D NAND flash memory are the Samsung 970 EVO Plus. The 970 EVO Plus will be replacing the 970 EVO as Samsung's mainstream consumer NVMe SSD. Today we are reviewing two of the launch drives: the 970 EVO Plus at 250GB, and the 970 EVO Plus at 1TB. These two drives are Samsung's attack on both the mainstream and high capacity markets, while the new NAND has a focus more on power than driving down overall costs per GB. Performance per watt is a key focus of these drives. Samsung's offerings for the 970 EVO Plus will range from 250GB to 2TB. Capacities up to 1TB will be available from today, with the 2TB model launching in April. Pricing for that part has not yet been announced, however it is likely to be at a similar price density per GB as the 1TB. Last fall, Samsung outlined their plans for transitioning from 64L to 96L NAND. Most of Samsung's SSDs that use TLC NAND will be updated to 96L NAND while keeping the same SSD controllers as current products. While the consumer products will remain PCIe 3.0 for the time being, Samsung's top enterprise drives are getting an update to support PCIe 4.0. This means that the Samsung Phoenix controller that is at the heart of their retail, OEM and low-end datacenter NVMe product lines will be sticking around for another year, including in the new 970 EVO Plus and relatives like the PM981a and PM983a. Samsung's fifth generation, 96-layer 3D NAND was first announced at Flash Memory Summit in 2017, and mass production began in July 2018 with 256Gb TLC dies. However, last year saw NAND flash memory prices crash as good yields and high production volumes of 64L 3D NAND created an oversupply. The major manufacturers have been taking steps to slow their transition to 96L NAND in order to avoid making that situation even worse for their profit margins, but they have not entirely halted the process. There's still strong incentive to provide annual updates to retail products, so it isn't surprising to see the 970 EVO Plus showing up now. Samsung's 96L 3D NAND process doesn't provide huge density increases to further drive costs down, but it does provide numerous performance and power efficiency improvements that make it a good way for Samsung to improve a high-end product like the 970 EVO. The new generation of 3D NAND upgrades the interface between the controller and NAND to Toggle-mode DDR 4.0, increasing the interface speed from 800Mbps to 1400Mbps while reducing the voltage from 1.8V to 1.2V. This gives Samsung the lead for another generation, as 96L NAND from Intel, Micron and SK Hynix will only support up to a 1200Mbps interface, and Toshiba/SanDisk 96L NAND is only at 800Mbps. Within each NAND flash die, Samsung has made improvements to read and program latency, now down to about 50µs and 500µs respectively, improving by about 30%. In order to reach 96 layers without resorting to manufacturing using string stacking, Samsung has made each layer 20% thinner, but this has not affected the write endurance ratings for the drives. Lately, Samsung has been giving more detailed performance specs than any other consumer SSD vendor, including precise SLC cache sizes and write performance after the cache is full, and random IO specifications at both QD1 and at unrealistically high queue depths. On the other hand, we don't have full specs yet for the 2TB model because it won't be shipping until April, but the press release suggests a few small advantages over the 1TB model. The smaller models use 256Gb TLC dies but the 2TB model needs the 512Gb parts in order to fit enough flash on a single-sided M.2 card. Compared to the original 970 EVO, the 970 EVO Plus improves performance at every capacity and on every metric, but unevenly: the biggest gains are to write speeds, especially sequential writes. The 1TB model is now rated for 3.3GB/s writes to SLC cache compared to 2.5GB/s, and 1.75GB/s after the cache is full compared to 1.25GB/s. Random read speeds are about 20% better, and sequential reads see the smallest benefit with an increase from 3.4GB/s to 3.5GB/s; the PCIe 3.0 x4 interface is preventing anyone from doing much better than that. It's interesting to note that the 970 EVO Plus performance specifications all now exceed those of the MLC-based 970 PRO, except when the SLC write cache is filled. In those cases, the 970 PRO is still rated for an advantage of 25–255% depending on which capacity is under consideration and whether the writes are sequential or random. Hardly anything has changed about the construction of the 970 EVO Plus; the PCB layout is unchanged save for the adjustment of a few of the smallest passive components. The part numbers for the NAND packages have changed in one digit to reflect the new NAND generation and the date codes on all the major components are about a year newer. The label on the bottom of the drive still has a layer of copper foil as a token heatspreader while the label on the top is still just plastic. Samsung did not provide price information for the full lineup before launch, but the $89.99 MSRP for the 250GB 970 EVO Plus is only slightly above the current street prices for the 970 EVO and matches what Samsung sells it for direct, so we don't expect any significant changes in the near term for the other capacities. In the long run however, NAND prices are still in decline and Samsung has had to respond to that. The original 970 EVO was initially announced for around 45¢/GB but this was cut to 40¢/GB before it even hit the shelves. Now, it's going for around 25¢/GB. Further price cuts to the 970 EVO [Plus] are likely over the coming months, but the transition from one model to another will cause some fluctuations depending on which one is in stock at more retailers on any given day. Where's the 970 PRO Plus? Conspicuously absent from Samsung's 96L roadmap last fall was any mention of MLC-based drives, and in particular Samsung has not mentioned a 970 PRO Plus. The lack of new MLC drives for the datacenter or OEMs is no surprise given how thoroughly those markets have shifted over to TLC. But on the consumer side, Samsung has been one of the few remaining holdouts offering MLC-based SSDs for enthusiasts and prosumers with their PRO drives. The later launch date of the 2TB 970 EVO Plus suggests that the only 96L NAND Samsung is ready to release to the retail market is their 256Gb TLC; the 512Gb TLC and QLC parts are probably still in the sampling phase for either the memory itself, or the OEM or datacenter drives are still sampling rather than in full production. If Samsung plans a regular MLC part at 96 layers, it's almost certainly the lowest priority to move off 64L, after they get both TLC parts and both QLC parts out the door. We can't rule out the possibility of a '970 PRO Plus' sometime this year, but it seems far more likely that we won't see another PRO NVMe drive until 2020 with a new controller that may also bring PCIe 4.0 support. Until then, the 970 EVO Plus takes over the performance flagship position for Samsung's retail/consumer product line and the 970 PRO is only relevant for workloads that involve sustained writes of hundreds of GB per day. For workloads that merely consist of tens of GB per day or include some disk idle time for the SLC cache to recover, the 970 EVO Plus is now likely to offer both better performance and better pricing than the 970 PRO. For the review today, we are testing the 250GB and 1TB versions of the Samsung 970 EVO Plus.